From January 17 to 22 I was in Tallinn, the beautiful capital of Estonia. I had never been there. It started with the usual invitation to give a keynote lecture at the Tallinn Winter School, a graduate training course in cultural theory and art. Hesitating because of the over-frequent travelling I have been doing this year, I accepted when the fabulous coordinator Tuuli Piirsalu made it possible to add to the lecture an exhibition in the Vaal Galerii - the city’s most prestigious art gallery - and a sneak preview of our film Madame B, for the students enrolled in the Winter School, which we wanted to do in order to get feedback on it. Three events, then. It was all very satisfying. The evening of our arrival the exhibition, which had been unofficially accessible to the public already for a week, was officially opened. Michelle was also invited, and we had a great time. The exhibition - a small satellite exhibition derived from the Madame B Project_is non-narrative, perhaps rather descriptive of the situation of being caught in emotional capitalism. This was presented on the first floor. On the second floor, a mezzanine visible from downstairs, showed the deeper causes of such imprisonment. We report extensively on this exhibition on the Madame B website, and on this site under Emotions and Capitalism, with photos and a short video walk-through. We had the immense pleasure to see some of the people involved in the project come to the opening. 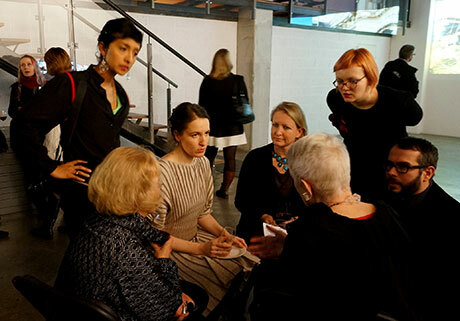 On this photo you see the cheerful group of, from left to right: Michelle (standing), Helinä Hukkataival (from the back), Marja Skaffari (who plays Emma), Mervi Appel (co-producer and curator of the next big show), gallerist of Vaal and curator of our exhibition Tiina Määrman (standing), and sitting, Marek Tamm, head of the Winter School, who had the creative intelligence to see the importance of this instance of “art-based research” for the 120 PhD students enrolled in the School. I end the circle, back turned to the camera. 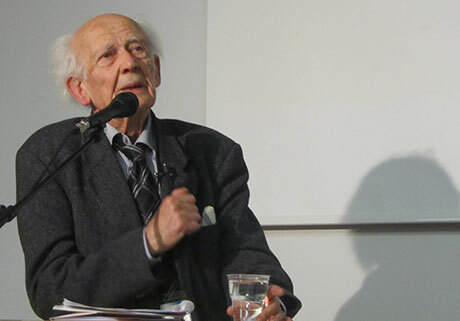 In the Winter School itself, which began on Monday, the first big surprise was the encounter with the famous social philosopher Zygmunt Bauman. I had never met him, and we had an instant connection. Like practically no one else I know, he manages to integrate a deeply critical perspective with sketching hopeful alternatives, and an in-depth analysis with broad historical overviews. I was, as a Dutch expression has it, “hanging on his lips”. In the hour-long discussion he came up with examples to explain his views. Each time it was an issue I had been thinking and worrying about. Another lovely encounter was with political philosopher Siobhan Kattago, who is currently editing a volume of memory in which I have a chapter. 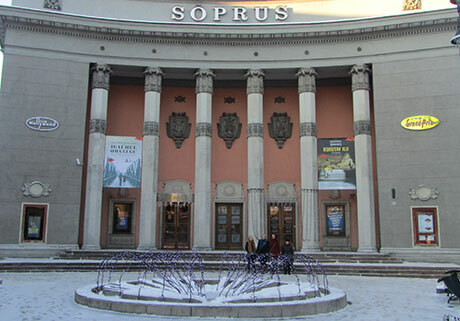 The sneak preview took place in an old Stalinist cinema, which has been preserved with its name, Soprus, meaning “friendship”. Below a photo of the outside and one of the inside. It has fabulous equipment. The Winter School has provides delicious wine and bites. 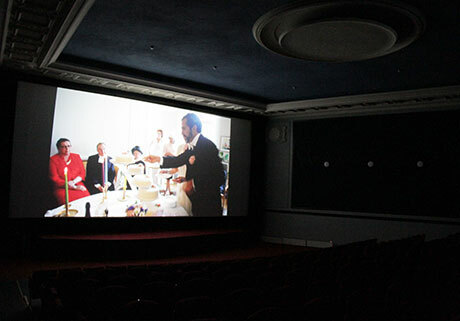 For the first time we saw the film on a big screen with beautiful sound. Sara Pinheiro’s sound track drew many comments. The excellent equipment made the sounds glorious in their mysterious allusive layering. It was clear to everyone that the sounds often have a memorial function. With Christopher Wessels’ brilliant camera work, Sara’s sound design, and the fabulous acting of everyone, I was completely convinced of the film.